Scott Power from Morgans CIMB sees recent share price weakness in Regis Healthcare (ASX: REG) as presenting a buying opportunity. The company’s shares have been sold down substantially over the last few months as a result of uncertainty within the age care services industry. Since the start of August the company’s share price has slumped from $5.25 to hit an all-time low of $3.45 last week before staging a recovery in recent days. Thursday’s closing price of $3.91 represents a sizeable discount to Powers’ price target of $5.13. It should be noted that analyst’s forecasts and price targets may not necessarily be met. Similarly, historical trading patterns should not be used as the basis for an investment decision as these may not be replicated in the future. The company’s fiscal 2016 performance was impressive having grown net profit by 24%, opened up 211 new places during the period and achieved an average occupancy rate of 95.2%. Fundamentally, the company is starting to look cheap, trading on a PE multiple of circa 18 relative to Powers’ fiscal 2017 forecasts. He is projecting compound annual earnings per share growth of approximately 27% between fiscal years 2016 and 2018. This represents superior growth to most of the group’s peers and it is worth noting that the industry group average PE multiple based on fiscal 2017 forecasts is 28.5. In terms of the industry environment, Powers noted that the Department of Health has provided more clarity over the charging for additional care and services in residential aged care, including capital refurbishment type fees. It was uncertainty regarding this issue that largely impacted sentiment towards the sector in recent months. 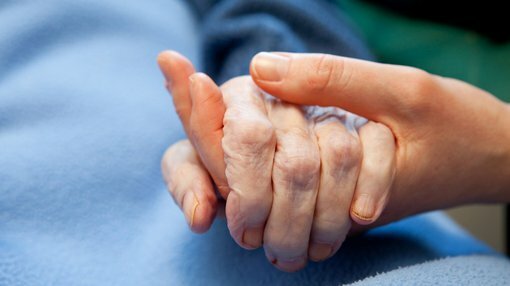 Recent commentary from the Department of Health indicated that it considers capital refurbishment fees, asset replacement contributions and similar fees would not be supported by the legislation where the fee does not provide a direct benefit to the individual or the resident cannot take up or make use of the services, or where the activities or services subject to the fee are part of the normal operations of an aged care home and fall within the scope of specified care and services. Powers noted that there appears to be poor communication between the government and the operators and that unconfirmed news indicates that the government may look to review the cuts that had been flagged, a development that would restore faith in the sector. Consequently, he has not made any changes to fiscal 2017 and 2018 forecasts, but taken on a more conservative stance regarding fiscal 2019 forecasts should changes be introduced. This indicates that there is near-term earnings reliability, suggesting that the extent of the sell-off is unwarranted. Powers summed up his stance on the overall sector saying, “We believe the underlying demand for aged places remains strong and we believe a sensible compromise will be reached between the government wanting to curtail the growth rate of expenditure and the operators who are facing residents entering their facilities with higher levels of acuity”. 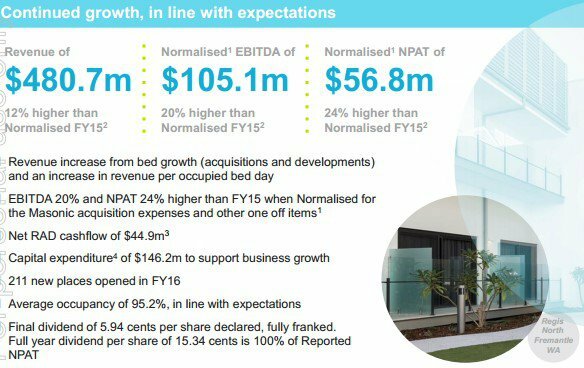 From an operational perspective, fiscal 2016 yielded some promising developments, particularly in relation to the acquisition of Masonic Care Queensland which effectively added 711 operational places, increasing the group’s portfolio by 14%. Management recently reaffirmed that the acquisition was on track to be earnings per share accretive in fiscal 2017, with the expectation that it will boost EBITDA by as much as $12 million. Regis offers strong geographic diversification with operations in all states and territories except for Tasmania and the Australian Capital Territory. The table below demonstrates the pipeline of projects that should underpin robust growth over the next three years.